Wine of South Africa (WOSA) has condemned a “biased” investigation into human rights abuses in South African vineyards. According to the report, many workers are forced to live in pig sties, are denied access to safety equipment, while employers ignore basic labour rights. WOSA chief executive Su Birch said that while the organisation doesn’t condone any form of human rights abuse, the report could be unfairly damaging for the country’s wine industry. Birch stressed that the report had the potential to do great harm to the industry that is already battling in the face of a strong rand and a protracted global economic downturn, without the benefit of the government support that its global competitors enjoy. “Ironically, it could also jeopardise the jobs of the very people it claims to be championing,” she said. “In the interests of the continuity of the industry and its capacity to create employment and sustainably improved working conditions, the wine sector deserves to be monitored with fairness and not to be undermined by assertions based on what appears to be random anecdotal evidence. Claims made in the report include workers having no access to sanitation facilities or drinking water, as well as being exposed to pesticides. “The wealth and well-being these workers produce shouldn’t be rooted in human misery,” said Daniel Bekele, Africa director at Human Rights Watch (HRW), which produced the report “Ripe with Abuse: Human Rights Conditions in South Africa’s Fruit and Wine Industries”. “The government, and the industries and farmers themselves, need to do a lot more to protect people who live and work on farms,” he added. 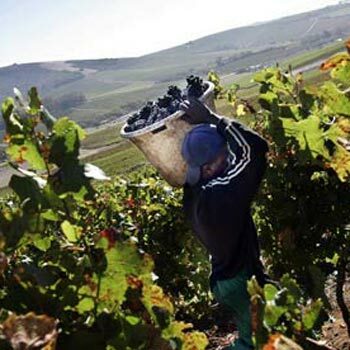 The report said that the centuries-old South African “dop” payment system, whereby workers were partly paid with wine, had largely disappeared, though it did find two farms that still provide workers with wine as partial payment. One worker was quoted in the report as saying: “During the week, I am given wine in the afternoon, at 12pm, and at 6pm in the evening. I also get this on Saturdays. On Sundays, we get wine in the morning, afternoon and evening. “In the morning, we get it before 7am, at 12pm, and we have to do Sunday prayer and then get more wine at 6.30pm. If you don’t want the wine, then it’s your choice. Birch said the 96-page report had used a questionable basis for the selection of many of the respondents interviewed in the study, while interviews with workers had not been independently verified and nor had employer reaction to allegations been sought. As a result, it was extremely difficult to respond to specific allegations highlighted by the study. South Africa has laws guaranteeing wages, benefits and safe working and housing for workers and other farm dwellers. But the government has largely failed to monitor conditions and enforce the law, HRW says. Birch said: “Readers of the report have no basis for understanding how representative the sample of respondents is. The study relies on anecdotal evidence that uses the cover of respondent protection to avoid substantiating the claims it makes. “Moreover, the media release, provocatively entitled South Africa: Farmworkers’ Dismal, Dangerous Lives and distributed internationally to announce the report, does not present a sufficiently comprehensive picture of conditions across the wine industry and as a result, is potentially misleading. “Like the report itself, the release disingenuously plays down the significance of the wine industry’s substantial direct and indirect contribution to improving working conditions through organisations such as the Wine Industry Ethical Trade Association (WIETA), and Fairtrade. South Africa is the world’s seventh-biggest wine producer, filling the equivalent of more than 1.2 billion bottles a year. Birch appeared on the Today programme on BBC Radio 4 this morning to discuss the issue. Listen here. Sadly the report highlights the negative and negates the good progress that have been made. In addition it sees the Wine industry in isolation totally ignoring the fact the workers of the top hotels, restaurants and business in every city may well be living in the shanty towns without the basic facilities like water and electricity. To isolate the SA wine industry and ignore the positive enthusiasm for social recovery reflects inexperience and out of touch with the rest of the world. As I am writing to you from China, I can without doubt say that we have little to be ashamed of compared to many other countries. We will continue to raise our standards and encourage our workers to commit to a program which will improve the conditions of all agricultural familes. While there may be some progress, there’s a lot of the angry, ugly old face of SA left, like THIS penned by the PR of some of the country’s most revered estates.